As your local Luxury Bath dealer, we offer fast, affordable, and lifetime-guaranteed bathroom remodeling solutions across the Phoenix area. From showers to bathtubs to bath conversions, our one day bath installations save Phoenix households time and money. Upgrade to one of our custom-designed bathtubs, and you can forget about chips, cracks, mold, and mildew. Our Luxury Bath showers are crafted to perfection from dozens of functional and cosmetic styling options. To build your dream bathroom, use our convenient online tool or work with our expert designers one-on-one. We can complement your tub or shower upgrade with new vanities, countertops, toilets, lighting, and more! Home Concepts Custom Remodeling is a family-owned bathroom remodeling company that strives to exceed our customers’ expectations for service, value, and quality. Thanks to our professional partnership with Luxury Bath, we’re able to build our clients’ dream bathrooms for less time, money, and stress—often in as little as just one day! Anyone can hang up a sign and call themselves bathroom remodelers, but few Phoenix contractors can match the qualities that have earned us Luxury Bath’s prestigious stamp of approval. For your next bathroom renovation in Phoenix, we won’t settle for “good enough”, and neither should you! See how fast and affordable our first-rate bathroom remodeling services can be by contacting Home Concepts today. We combine the expertise of our local, family-owned bathroom remodeling business with the premier quality of the Luxury Bath brand. We’ll reduce the burden of your remodel with bathtubs and showers that can be fully installed in one day. Our expert tub and shower installations are approved by Luxury Bath and backed by their lifetime warranty. If you have a valid quote from a competitor for the same bathroom renovation work, we’ll meet or even beat it! 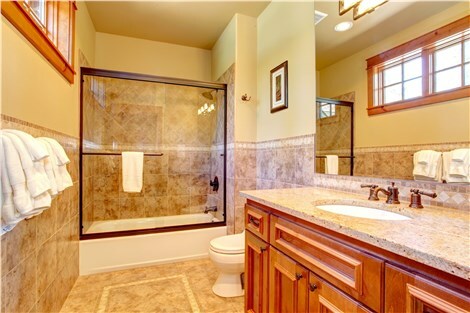 We work with trained and certified bathroom remodelers who can be trusted for a fast, professional installation. Our family cares about yours! You can expect friendly support and 100% satisfaction with your bathroom design and installation. Read reviews of Home Concepts Custom Remodeling from some of our past customers. "Was very impressed with the quality of work at the end! Will highly recommend this company to my friends and family." "We were able to remodel my bathroom in one day and I absolutely love it! It came out better than expected. You won’t be disappointed!" "I am so glad we found Home Concepts before we signed with bigger named companies. Within 3 weeks our walk-in shower was installed and we are so happy with the finished looked." A lot of companies say they offer the best pricing—but we take that promise one step further with our Home Concepts Custom Remodeling price matching. $1000 Off Full Tub/Shower Remodel! Save big money on your upcoming bathroom remodeling project with this April Special!